We appreciate your support in conjunction with the Oklahoma Business Ethics Consortium & Foundation. 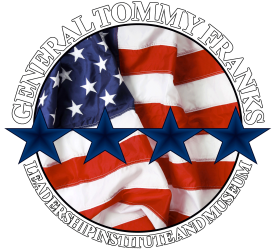 Please RSVP for these special opportunities in correlation with Four Star Leadership by June 24 by making your purchase below or call the General Tommy Franks Leadership Institute and Museum at (580) 726-5900 for more information. Events will be held in Oklahoma City including the Four Star Leadership Luncheon and VIP Dinner Reception on July 17 .